This article is dedicatedly written to show all the steps which are used to create Oracle Database Cloud Service instance. PDB Name: PDB is only for Oracle Database 12c. Enter the pluggable database (PDB). Usable Database Storage (GB): The amount of storage in GB for actual database data. Compute Shape: The number of Oracle Compute Units (OCPUs) and amount of memory (RAM) for each compute node of the new database deployment. Advanced Settings: Character Set: The database character set for the database. Advanced Settings: National Character Set: The national character set for the database. Both Cloud Storage and Local Storage: Backups are configured to be created automatically and stored both on local storage and on cloud storage. If this choice is selected, the Cloud Storage Container, User Name, and Password fields will be displayed. Cloud Storage Only: Backups are configured to be created automatically and stored in cloud storage. If this choice is selected, the Cloud Storage Container, User Name, and Password fields are displayed. None: Backups are not configured for the deployment. On the confirm page, review the information listed. If satisfied with the information, click Create. Once click on Create button, it will take approximately 30 minutes to configure the instance. Within 30 minutes, we will have a fully functional 12c database in the cloud with backup/recovery configured, ssh enabled, APEX installed, a specially created DBaaS monitor, and more. In the next blog, see how to connect Database instance using SQL developer. 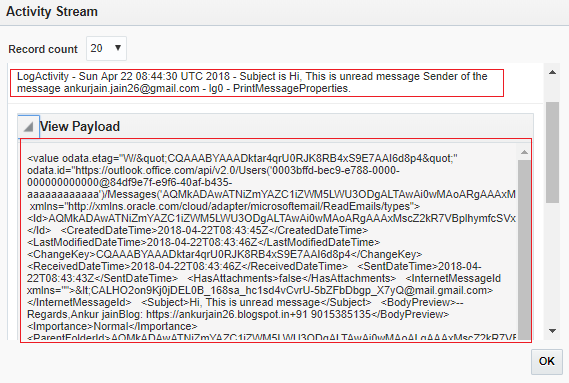 This blog is the extension of the blog in which we have showcased how to read messages of a specific folder of the Microsoft account using MS email adapter in Oracle ICS. 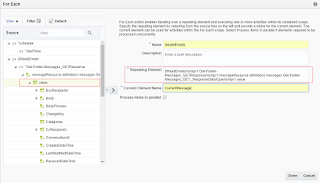 ICS doesn't allow to put any request parameter while configuring the MS email adapter in the request. However, If we see the Microsoft REST Service documentation, this allows to put request parameters (search, filter, select, order by, top etc..) in the REST APIs. Export the Integration that we created in the previous blog. 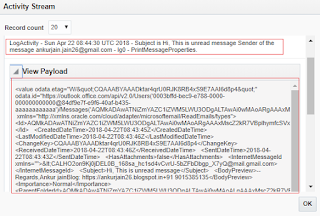 Edit the ReadEmails_REQUEST.WSDL first. Notice the below-highlighted parameter. 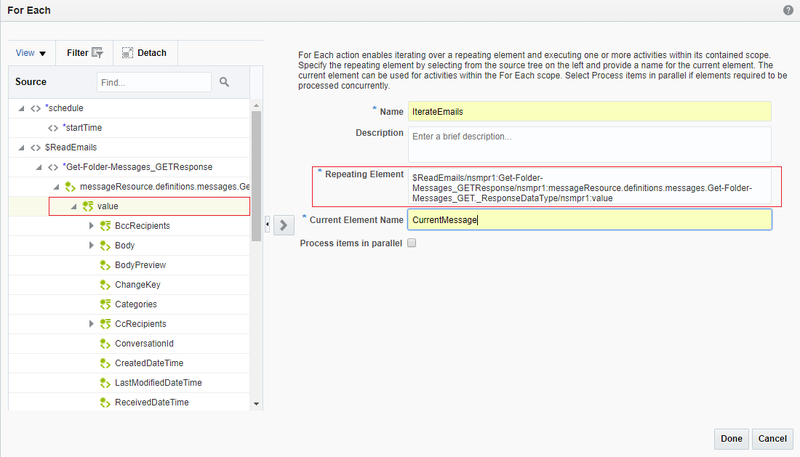 Edit the ReadEmails_REQUEST.jca file and add highlighted property in endpoint-interaction node. Save both the files. Open the .iar directly file using 7-zip and replace the updated content in both (WSLD & JCA ) files. In the query parameter _0x646c72_filter we will assign IsRead eq false. This value will fetch all the email which are unread. Since there is no unread email in the Inbox as yet, that's the reason there is the blank response. Notice one unread email fetched as per the filter added. 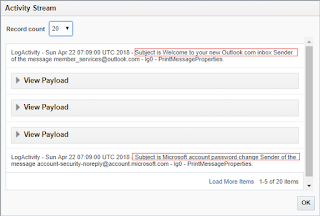 Microsoft Email Adapter in an Oracle Integration Cloud Service allows retrieving messages in Office 365 and Outlook.com. The Microsoft Email Adapter enables to manage messages, manage folders, and so on. 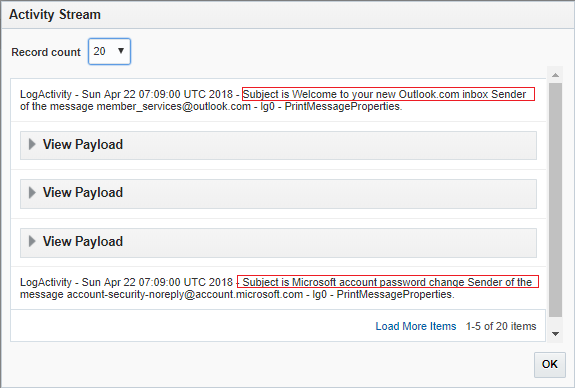 In this blog, will demonstrate how to read messages from outlook from a specific folder. Notice a Template parameter with name folder_id. This is the folder name from which all the message would be read. If you have 10 messages in your Inbox, the loop will be iterated 10 times and all Subject and Sender of the messages will be printed. Next blog will show how to filter messages from the inbox.